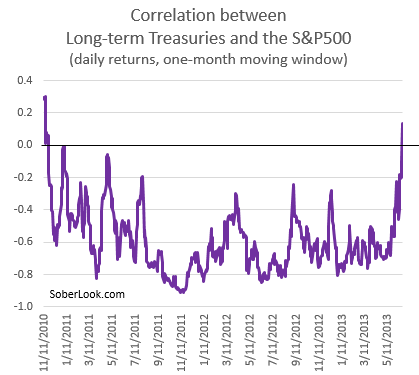 The last time short term correlation between treasuries and US equities turned positive was at the beginning of Fed's QE2 in 2010. At the time both equities and treasuries rallied in anticipation of the new stimulus. Now we are back to positive correlation, except this time the reverse is taking place (at least in terms of expectations). Treasuries no longer provide the hedge for equities portfolios that the markets have become accustomed to (see discussion). It may take another crisis to send the correlation back into negative territory.